The word upcycle seems like a classier description instead of recycle. They both mean the same thing but to upcycle seem to be such an upbeat description for this pattern. Do you doodle? Why not doodle on an "fun"ctional "upcycled" piece that will last for years to come? When I sit in the evenings and watch TV I usually have a sketchbook available to doodle when the mood strikes me but now I doodle on bottles. The new Deco Art Glass Paint Markers are an exciting product which I have been using since I discovered them. These markers will revolutionize your glass painting experience. 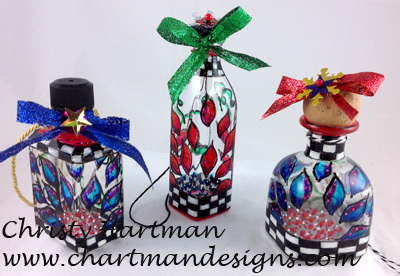 This pattern is a fun yet "fun"ctional piece which uses the glass paint markers to help you develop these doodled whimsical ornaments. This is the perfect inexpensive project for those of you who are DIY creatives!!!!! Purchase this pattern and learn how to apply the paint with numerous step by step photos and instructions to complete this gorgeous project as well as tips and techniques which I have discovered and pass on to you. I also include the line art to help you develop this ornament project. You will see in this pattern photos illustrating the techniques on different bottles than were used for the pattern as well as the bottles used in the pattern. These techniques are very versatile and can be used on the bottle of your choice. Come and join me in the "Glass Paint Revolution". You are purchasing an E-Pattern and once payment has been received you will receive an email with instructions to download the pattern.